When your whole life has vanished and only one person knows who you are . . . don't you have to believe him? She and Sam start a new life, just the two of them, and Abby's deliriously happy. Until memories from her past begin to haunt her and suddenly everything she's learned to love turns sinister. It's only a matter of time before her reality cracks apart. What on earth do I say about this book. It is without a doubt the strangest book I’ve ever read. 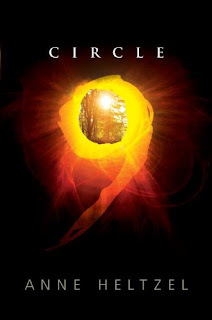 Yes, that title was formerly held by Bumped by Megan McCafferty, but now it belongs to Circle Nine by Anne Heltzel. I really can’t tell you anything about the book in detail, because it would just give away everything. The only thing you know going into it, is that there was some sort of fire, and that Abby doesn’t remember who she is. She is rescued by Sam, who takes her to a mysterious cave “palace” where he takes care of her, protecting her from Circle 9, and the horrors of that world. She thinks that Sam is/was/could be her soulmate, and everything in life revolves around him. But soon she starts questioning everything: the things he tells her, what she believes about Circle 9, where she came from, and even her own sanity. I wasn’t planning on reading this. I brought it to my mom’s house for her to read, along with about ten others, but it was sitting there and I started reading the first page and was completely SUCKED IN. I loved the writing! After page three, I looked at my mom and said, “Uh….I think I’m reading this book….sorry!” Before I knew it I was half way through. It was intriguing and mystifying, and I just wanted to know what on EARTH was going on. I love a good mystery. For more details, check out Circle Nine on Parental Book Reviews. I loved Stolen, so I might just add this to my TBR list! I think I might be even more confused about this one than before. I'll have to read it to see what you mean. Thanks for the review! I think you may have convinced me to read this book. I received an ARC of it... but I wasn't sure if I wanted to read it. Thanks for the review! Unfortunately, I'm just not a fan of weak protagonists. So I'm still on the edge.